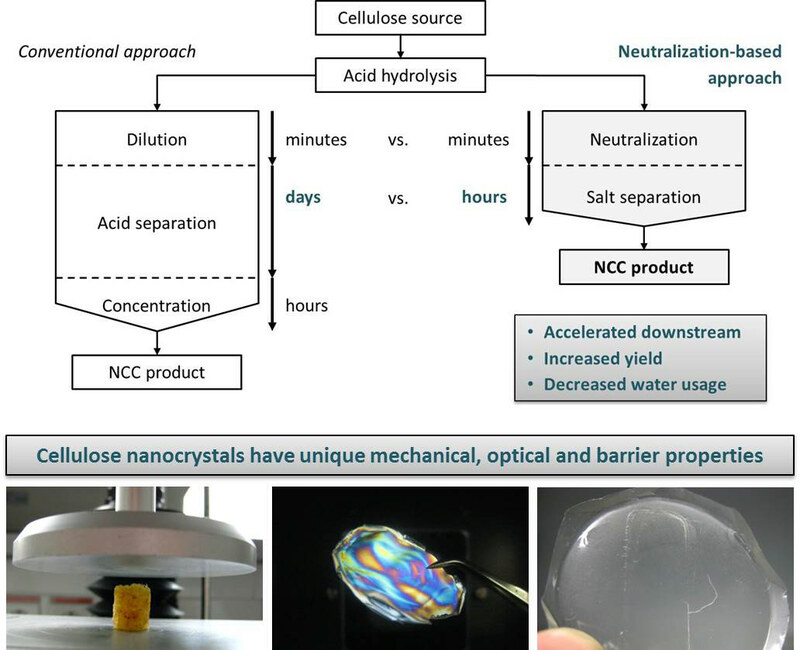 Nanocrystalline Cellulose (NCC) is a renewable material that has many interesting properties and a wide application range: To cite a few examples, NCC is widely investigated as a reinforcement material and due to its nontoxicity and biocompatibility it is a highly suitable material for implants or drug delivery systems. However, although NCC is an industrially promising material, its production remains complex, expensive and takes several days. Furthermore, the yield of the currently employed prepa- ration procedures is low and usually does not exceed 20 %. These circumstances represent significant obstacles, preventing a widespread application of NCC. With the present invention the production process of NCC is substantially simplified. The preparation procedures for NCC are typically based on acidic hydrolysis of cellulose fibers, which is so far stopped by diluting the suspension with large amounts of water. Here, an energy-consuming step is no longer re- quired, as the inventors found a way for the controlled neutralization of the suspension by terminating the acidic hydrolysis. This uncomplicatedand very effective step in the production procedure enables an easy-made separation of the NCC by centrifugation, which leads to a significantly higher yield. Figure: Comparison between the conventional and the Neutralisation-based NCC production approach.